In Pennsylvania, text-dependent analysis is a big deal. Teachers in schools all over the state have probably worked with their text-dependent analysis (TDA) data this fall. The issue with TDA essays, however, is that your efforts in one area from the above list do not lead to instant improvement. As with summarizing, it's like playing a game of Whack-A-Mole--as soon as you deal with one issue, another one pops up. But we must not despair...nor must we fall into the trap of sacrificing high-quality instruction for the sake of one assessment. Again, as with summarizing, there are good teaching moves that can improve a TDA as well as being worthwhile in the greater sense, beyond the requirements of school and state. I think it's time to shift the reading discussion back toward the idea of "envisionments" as described by Judith Langer. As she writes, "Envisionment building is an act of becoming – where questions, insights, and understandings develop as the reading progresses, while understandings that were once held are subject to modification, reinterpretation, and even dismissal." I just love this thinking about envisionments. The texts we share in the classroom aren't just what's printed on the next page in the reading series; in the minds of our students, they become so much more. Anyone who taught in Maryland in the early 2000s remembers building questions around the stances of Global Understanding, Developing Interpretation, Personal Connection, and Critical Stance. And guess what? These ways of looking at a text lead students very well into the kinds of thinking needed for a TDA. With the tumult surrounding the arrival of the Common Core, the stances and envisionments were dropped at the school level. I have lots of cynical ideas about why and how this happened, but do you know what? The stances make sense and bring up the level of classroom discourse! 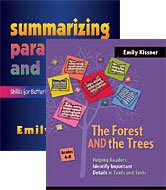 In Pennsylvania, the TDA always has students connecting two different elements of the text. For example, students might have to show how the character traits relate to the theme. In expository text, students may need to show how the organization of the text conveys the key ideas. My reasoning is this: If students don't get to thoughtful analysis and comprehension at the discussion level, they'll never get there in writing. Grading 20 well-structured but empty analysis essays is a thankless task. Students won't put effort into the writing portion of the task unless they care about what they're writing about! Engaging in group discussions and meaningful conversations is a proven way to get kids to care.